8 year/s ago 1661 Visit WebsiteSoftwareBroken link? 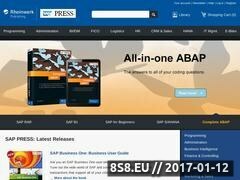 SAP PRESS is the premier publisher of technical and strategic books for the entire SAP community. Choose from over 250 titles on Financials, HR, SAP BusinessObjects, ABAP, Supply Chain Management, SAP NetWeaver, CRM, GRC, and many more. THE VIEW THE VIEW is the industry’s most trusted provider of expert, in-depth technical advice on Lotus Notes and Domino. Insider Learning Network This independent sap resource offers articles, podcasts, webinars, blogs, forums and more from industry experts and peers. HR 2011 Experts from independent consultancies, sap, and leading sap customers present on sap functionality for human resource activities.